Protect teeth and gums from injury while communicating better with highly breathable and speak-able mouthguard protection. Developed by Shock Doctor, the world leader in mouthguard science, to handle the hard court, hard elbows and hard shots of basketball. Sink into full coverage, ultra comfort and a superior low profile design. Performance fit like the pros at a fraction of the cost. 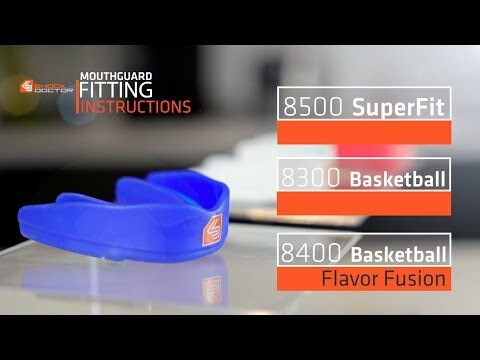 Toronto Raptors NBA Basketball Mouthguard is rated 4.2 out of 5 by 6. Rated 2 out of 5 by mrboil from Overheating - warning - DO NOT BOIL IT !! If you boil the water, it automatically shrivels up the guard in 3 seconds and makes it unable to use properly whatsoever - while the do not boil "warning" is in the VIDEO online it is NOT mentioned in the instructions that come with the mouthguard, so I am upset I now have to buy another one at my local sports store - they should make it EXPLICIT in the hard copy instructions that come with it, the instructions are vague and say just "heat to 150" pretty much - bottom line: if you overshoot on the temps even slightly, you effectively wasted your $20 - like I just did. good luck! Rated 4 out of 5 by Qasim S. from Boston Celtics NBA Basketball Mouthguard This mouthguard is nice in terms of design although it can be challenging to get a good fit with boiling and molding method. I had to repeat the fitting method 4 times initially.